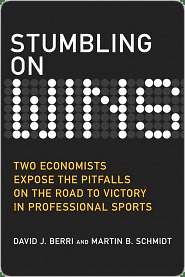 Two Economists David Berri and Martin Schmidt recently published the book Stumbling on Wins and are offering a free copy in a contest which I will explain shortly. I know David from his Wages of Wins Journal which centers around his first book. As well as being an excellent writer, David is a Tigers fan and a sabermetrician. Don’t they want to win? Every sports fan asks that question. And no wonder! Teams have an immense amount of detailed, quantifiable information to draw upon. They have powerful incentives for making good decisions. And yet, they keep making the same mistakes over and over again...mistakes you’d think they’d learn how to avoid! Now, two leading sports economists reveal those mistakes in basketball, baseball, football, and hockey–and explain why sports decision-makers never seem to learn their lessons. The next quantum leap beyond Moneyball, this book offers powerful new insights into all human decision-making. Because if multimillion dollar sports teams are getting it wrong this badly, how do you know you’re not? You can preview and purchase the book at Amazon. Now for the contest. Again, the winner gets a free copy of Stumbling on Wins. There is one main question and one tie breaker question. If there is still a tie after the tie breaker, then there will be a random drawing. Please send your answers via e-mail: TIGER337 (at) COMCAST (dot) NET (I left out @ and . to throw off SPAM bots). Also, please put "Book Contest: Stumbling on Wins" in the header of your e-mail. The contest closes on April 16 at 8:00 PM. Main Question: How many runs will the Tigers score against the Seattle Mariners in the three game series from April 16-18? Tie breaker: Which Tiger will get the most hits in the series and how many will he get?